Delicious looking. Even in winter you have a very healthy lettuce. I love Lettuces – winter, spring or summer, I always have a special place for them in my garden. Very surprising! I’ve never seen lettuces fresh like yours with that temperature. Those greens look fantastic. Well done! Looks so Green and fresh, yum!I love lettuce! I love lettuces and salads in general. I tend to be a lot more healthy in summer though. I’ve recently cut out all fizzy drinks and am only drinking water and eating a lot of fresh salads too. Pity i can’t cut out my morning cup of coffee! Great effort – lettuce like this can be so fragile especially in the winter months! It’s important to regularly keep cutting it so that it maintains a steady growth because sometimes if you don’t it can hold it back. 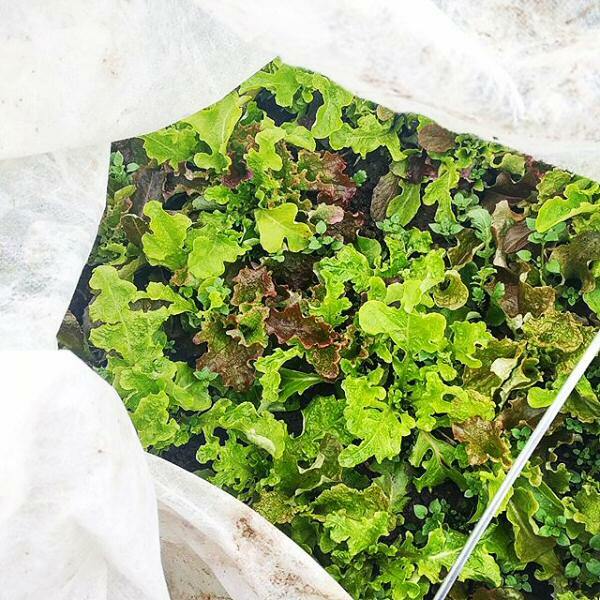 Even in the cold, your crop of lettuce looks delish! Wonderful! but why i it wont go in cold sometime it is looking so pretty . I live in a cold are, too and I grow vegetables indoors during the cold months. It’s pretty easy, the biggest expense are the lights, but you can just use a regular fluorescent light fixture. No need for specialized grow lights or anything. No matter what season it is now, I love to eat crispy, colorful lettuce. Yours’ are looking so good at such temperature. Keep it up! Great picture. It looks nice. Bw, did you use any kind of special indoor grow light? I didn’t even know lettuce would survive in temperature that cold! I am a little confused – you are saying these lettuce are able to grow through winter in below freezing condition? Do you mind sharing a bit more about the varietal in future posts? Thanks for your helpful information. I would like to hearing from your more in future. and please keep continue your work and help us to give more useful information.